It's been years since we last set our feet to the beach. 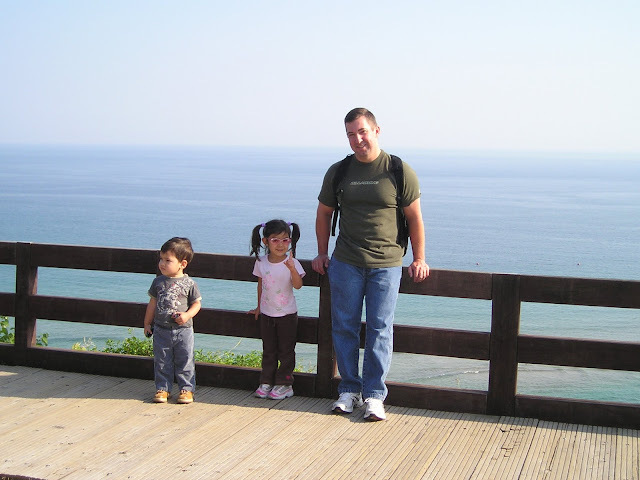 Our last time was when we had our island hopping in South Korea. 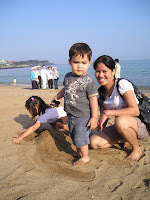 The kids had so much fun building sand castle and soaking their feet in the seashore. The place where we live is very far from the ocean so we have to fly to get there. I can honestly tell you that spending in one of the beaches in the topics would be fantastic. If only we could do magic and have the things that we need and go right away, sigh. But someday soon, who knows we might get a chance to travel again and enjoy the sandy and sunny beach. I remember when we went out and grabbed some snacks at Home Plus in South Korea, my daughter's face looked weird when she tasted the coleslaw lol. I watched the 2010 movie "The Last Song" a couple of weeks ago. Although I am not a fan of Miley Cyrus, I love the the story of the movie. It's a tear jerker drama movie centered on a rebellious girl who spent the summer with her Dad in a Southern Beach. A movie that focuses on second chances, forgiveness, and family. It's an old movie and I am sure that a loftof you have seen it already but if not, it's a must see. Below is the music "When I look at You" video by Miley Cyrus. I love this song and I think she did a wonderful job singing it. On acting however, Liam Hemsworth outshines her . He did an outstanding acting on this one. It's believable and so natural unlike Miley. But that is just my own opinion. If you are looking for the perfect gifts for him, check out the selection at this website that I found. Usually men are into electronic and other gadgets so you might find the best one that your husband or boyfriend may like. My husband is very picky when it comes to receiving gifts so I would always ask him if he likes a certain product or not. He is very opinionated so I get him the gift based from what he tells me about it. How about you? Do you surprise your sweetheart when buying a gift? I was taking photos of these tulips at my FIL and Ms. Gracie was in the mood for a photo shoot hehehe. During our mini nature trek last Holy Saturday, we found this flag in the middle of the woods. Someone had a camp fire there and left the flag stuck in one of the tree branches. Wishing y'all a happy weekend! We visited my FIL again tonight but hubby did not able to do the things that Dad needs help with. I think he will do it tomorrow. He has to fix something from the gutter of the house. I don't think he would need a timing pulley but Dad said that he put the things that he needs in the garage. My FIL has been cleaning his house lately. He is trying to get rid of stuff that he doesn't need anymore. I hope that Dad will live a lot longer so the kids can still enjoy his company. He is turning 90 this year. I put all the jigsaw puzzles that we have finished nto frames and hang them at our basement wall. I put one near our mini gym so I have something nice to look at when I work out hehehe. When my husband first started going back to college, this was when he was still in active duty in the Navy, he started off with a Nursing course. He was almost done with it, all he need was to to go to a hospital and do his internship. He wasn't able to do that because we got transferred to South Korea. When we were there, all he could do was an online course so he took General Studies and graduated with Associate of Arts, General Studies. When we came back here, he enrolled in Nuclear Medicine, he did it for two semesters and he found out that job opportunity on this course was so scarce, so he diverted to Accounting. He is now down to three subjects after this semester, so hopefully he would graduate soon. Taken when we were going down to the hall where the Recgnition ceremony in his school took place. He told me that after the summer class, he still have benefits left from his GI Bill so he wants to use it to get a certification for Medical coding. Hubby has so many credits in college now that if he could have took just one course, he could have a master's degree with all the benefits that he gets from GI Bill. But I guess it is not too bad to explore of the possibilities, so I support him fully! Summer time is here and I bet that most of you are planning for your getaway. Here's something cool that I found online, some tips and suggestions on where to go for a summer getaway. You can find deals and other travel packages at the site. For us, we would not go for a big vacation this year but we still have plans on visiting places around the area that we haven't seen yet. We will keep it local this year because of budget concern. How about you? Photo taken by Ms. Burrito. Champ is our loyal gardener helper. Below are some of the drive-by shots I took when we went to my husband's school and attended his Recognition Day. Robert Morris University is a huge campus. They are constructing this Wayne Center as addition. RMU is known for it's business courses. The education focuses on engaged learning experiences for every students. They also offer online education. Ms. Burrito asked me if she could blog during her Easter break so I let her do it. She enjoyed visiting other blogs and leaving comments. It takes her forever to finish bloghopping though lol. Going to bed now folks, thanks for dropping by! I wrote some reviews about the Miracle Gro's Expand n' Gro and they sent me these samples. It was a timing because we were doing some landscaping at the front lawn so I was able to use them. Hopefully it will help my newly planted plants and still praying that we wont get a surprise frost. We have been having cold nights and I am getting worried that it would affect my plants but I hope not. I will show you the progress we made this past Easter week about our landscaping project. It's not as beautiful as the professional landscaper could do but it's cheaper to do it ourselves. I bought a microfiber electronics cloth to clean up our TV and computer monitor. A good thing to have if you have LCD, plasma, or flat screen electronics. We been putting out seed bricks at our backyard and the cardinal visits everyday..
Can't get a good close up photo of him though. He flies away every time I get closer. Ms. Burrito is inspired to do good in her class that's why for the second time in a row, she has the most stickers among their class. Her teacher got her the Littlest Petshop as a reward. It's nice that teachers give this initiative to reward students who do good in class, it inspires them to do even better. We visited my SIL's home last night and I saw these colorful Easter eggs display at her table. I couldn't pass the chance not to take a photo hehe.